A series of powerful and easy to use DVD and Video edit functions. Aiseesoft DVD to WMV Suite for Mac also provides a series of powerful and easy to use DVD and Video edit functions such as trimming a clip of video, cropping video size, merging several video files into one file. What's more? You can even add both text and image watermarks to the video. The "Trim" in Aiseesoft DVD to WMV Suite for Mac helps you to get any part of your DVD or video file. The "Crop" allows you to adjust the video play region to suit your players. The "Merge into one file" aids you to enjoy a successive videos by converting your DVD or video clips into one file. Aiseesoft DVD to WMV Suite for Mac owns the way to adjust your video Brightness, Contrast, Saturation. Even check deinterlaicng by converting interlacing video to progressive video. Qweas is providing links to Aiseesoft DVD to WMV Suite for Mac 3.2.20 as a courtesy, and makes no representations regarding Aiseesoft DVD to WMV Suite for Mac or any other applications or any information related thereto. 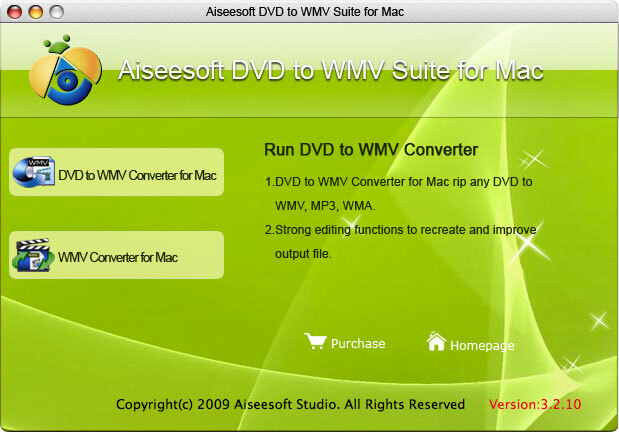 Any questions, complaints or claims regarding this application Aiseesoft DVD to WMV Suite for Mac 3.2.20 must be directed to the appropriate software vendor. You may click the publisher link of Aiseesoft DVD to WMV Suite for Mac on the top of this page to get more details about the vendor.